Yes, that's our theme: Conquer your fear and get high on nature. We did some tree top adventure extreme in Subic. Easiest game was the chair lift (1 hr canopy ride) above the trees- 140 to 220 feet long, span 12 platforms built around tree trunks, 100 feet above the ground. The most super duper fun was the superman ride. I didn't get any picture but basically your posture is like superman gliding through thin air looking down on the whole forest. We had lutong kawayan for lunch. We all sat in this long table using our hands and banana leaves to eat. This picture was taken after eating. We all finished eating in about 5 mins. because of hunger. Anyway, on our way to subic, we had a pit stop in between Angeles and NLEX shell station. 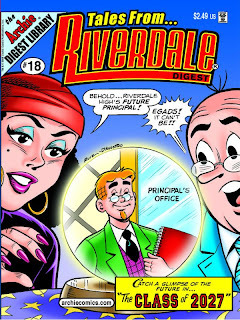 Went to Select and bought three Archie comics - 2 Jughead with the all new look and Tales from Riverdale Digest 18. It tells about Chucky Clayton and his comic indie trying to promote in the comic con. His original character named "Danger Giraffe 3000" making a hit in the Riverdale Con. We ended up bringing home 6 live chickens. This was due to the fire making and cooking of chicken activity being cancelled due to lack of time. Talk about challenge, our tour bus airconditioner broke down on the way home to Manila. KC - di naman dyosa... diawata lang hahaha!